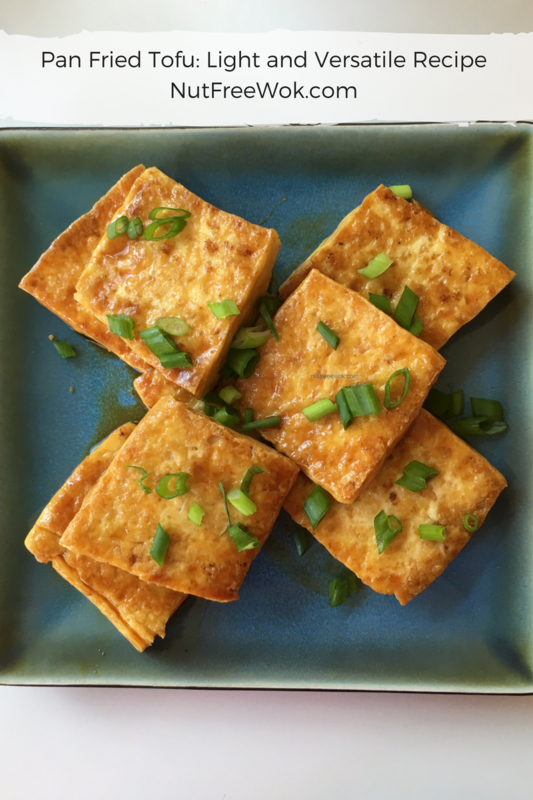 You will love this pan fried tofu with teriyaki sauce, it’s a delicious way to enjoy some tofu for a meatless meal and one of my son’s favorite dishes to make and eat. When Jimmy and I first got married, I noticed that he really enjoyed his mom’s pan fried tofu and I asked her how to make it. She told me to fry the tofu pieces in about 1/4 inch of oil, drain the oil, blanch the tofu and then braise with broth and seasoning. I just don’t deep fry (or even shallow fry in 1/4 inch of oil) and set out to find a lower fat way to make something similar. My younger son also loves tofu so I came up with this easy recipe, which my son can make (see photo). The tofu is much easier to fry after it’s been drained or blotted. The easy way is to cut two slits along the long side of the box and lean the box against the side of a medium bowl and refrigerate an hour or two. If you decide last minute to make this dish, then you’ll get the best results by cutting the tofu block into 8 pieces, pressing and blotting with paper towels. The frying pan needs to be hot. I warm it up on medium to medium-high heat, set a timer for 5 minutes, and do other prep in the meantime. You can use a non-stick frying pan (medium heat only) or a stainless steel frying pan, using a little non-stick cooking spray if you have any concerns about sticking. Patience is required. When you start frying, don’t move or touch the tofu pieces in the frying pan until they’re golden brown and ready to flip. I like using two spatulas, one to get under the tofu and flip it over, the other spatula to keep it from landing on the other pieces. One can season the pan fried tofu with salt and pepper or season with their favorite soy sauce alternative. 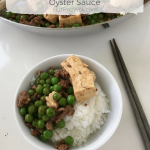 Top with green onions, toasted sesame, or furikake if desired and serve as a side dish. 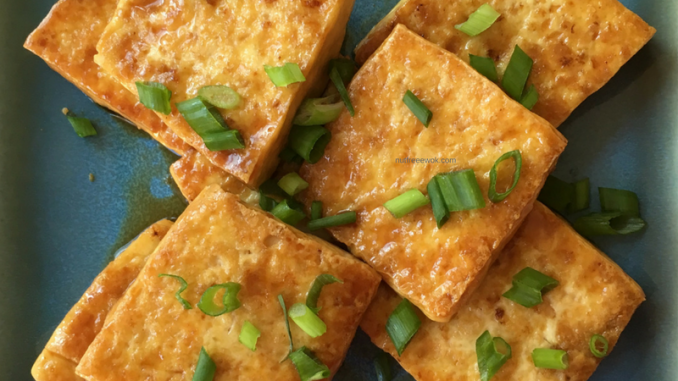 Other possible uses include cutting up the pan fried tofu into bite size pieces to top salads, add to stews and curries, or anything you like. 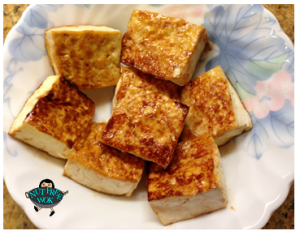 Our family enjoys pan fried tofu with a little Yoshida sauce and eat it as a side dish. non-stick cooking spray as needed . About 1-2 hours before you want to start frying, rinse or wipe the outside of the tofu box of any dirt or contaminants. Cut two slits on parallel sides of the tofu box, drain the liquid, rinse with water and drain again. Lean the box against the side of a large bowl to allow the tofu to drain in the refrigerator for 1-2 hours. Preheat the frying pan on medium to medium high heat, for 5 minutes until a drop of water sizzles on the hot pan. Remove the plastic film from the tofu box. Cut the tofu into 8 pieces, Add 1 teaspoon of olive oil to the frying pan and allow it 30 seconds to heat up. Use non-stick cooking spray as needed. Gently place the tofu pieces on the frying pan and allow adequate space between the pieces. Pan fry for 8 minutes or until the bottoms look golden brown. Carefully flip each piece over and fry for an additional 8 minutes. Brush some Yoshida sauce on the tofu pieces, flip them over, pan fry for a minute, brush on more sauce, and fry the second side for one more minute. Immediately transfer the pan-fried tofu to a serving dish otherwise the sauce will burn. A reader recommends using a tofu press because it takes just a few minutes. I haven’t tried it before, but thought it might be interesting. Do you use one? And do you have a recommendation for a good tofu press? If you see any of my posts on social media, please like, retweet, comment, or share. 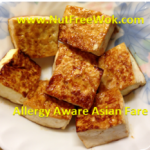 I would love your help in sharing Allergy Aware Asian Fare with your friends so that I can spend more time working on recipes. I may mention the names of stores and/or brand names of products that I use because readers ask and I share products and sources which I use and think may be helpful to readers, all opinions are my own. Please note that manufacturing practices and ingredients can change at anytime without notice and readers are always responsible for assuring allergen safety before buying or consuming foods. 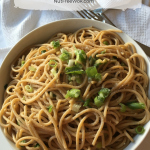 NutFreeWok.com is a participant in the Amazon Services LLC Associates Program, an affiliate advertising program designed to provide a means for sites to earn advertising fees by advertising and linking to Amazon.com. Thank you for your support! 3, 2, 1, GO! What a great first day! Oh WOW! I have literally failed at pan fried tofu MANY times!! NOW I see why! I tried to coat it in corn starch and ended up making glue! Ok–NOW I think I’ll try it again! THANK YOU so much! Can’t wait to try again! Can’t wait to try this one!!! I tried your recipe out and it came out perfect!!! I’ve made this in the past and didn’t fry it long enough so the fried tofu was limp. This recipe came out nice and crispy and delicious! Thank you!!! Whooo-hoo! Great to hear your success, Faith! Looks interesting. What do you serve this with? Also, for pressing tofu, I just love this tofu press. I use it all the time to get the water out of tofu, and it takes only a few minutes (10-15). We eat this on the side. Because tofu has a mild flavor, it goes great with meals that have a strong flavor such as curry or stew. When we have leftover stew or curry, but there isn’t enough leftover meat, I make some pan fried tofu to give the meal a protein boost. I saw a recipe today that slices this kind of pan fried tofu to make a breadless sandwich. Thanks, Diane, for the suggestion of the tofu press, it’s perfect for situations when one can’t plan ahead to drain the tofu! There isn’t a safe cooking spray for our allergies so do you think I should use a tad of canola, olive or butter in place of the spray? Hi Dani, great question! The non-stick spray is optional but makes frying the tofu easier. If you don’t use non-stick cooking spray, I recommend doing whatever you normally do to make scrambled eggs not stick. So for example, maybe use a non-stick pan or 1/2 tsp. more olive oil or canola oil. Another suggestion is to let the oil heat up for 30 seconds before you add the tofu. 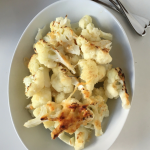 Sharon – Thanks so much for your recipes & website. 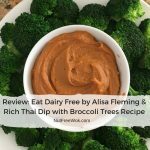 My daughter has nut allergies and I was so glad to find out about you. I have made the pan fried tofu for my family 3 times now and we love it! The first couple times I made some with yakisoba and some with soy sauce. Today I made it with chopped ginger root & garlic in the pan and added it to other stir fry. Yum! DeeDee, thank you so much for taking the time to share such a kind and thoughtful comment! It’s truly heartwarming and makes me feel like the effort I put into the recipe development is worthwhile and helpful to readers. Your ideas are wonderful, please take pictures and email them to share your ideas with others. If you can send me a message thru the FB page, I’ll send you my email address. 🙂 Thanks!! !